If you're looking for a way to cool down your laptop without hijacking another USB port or wall outlet, then Cooler Master might have just the thing for you. Rather than bolster your machine's existing cooling solution with extra fans, the clever design features an adjustable tilt that exposes the laptop's underside and provides better overall airflow. The NotePal S is pretty much perfect for anyone who has tried fan-based coolers and can't quite seem to get their heat down. Without telling you too much, dear reader, this Gizmodo writer's lap is pretty much on fire for the better part of the day, and that's not just because of all of the hot articles we handle around here. One inherent disadvantage of the design (for some), might be the fact that it significantly cuts down on portability, as the unit doesn't look like it would sit very well on a lap. That being said, it's still a new idea on how to keep laptops cool while at home or at the office. For $30 you get a silent, powerless laptop stand with six different levels of tilt. 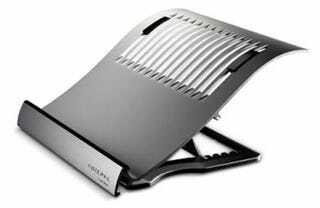 The NotePal S is said to support laptops anywhere between 12 and 17 inches.